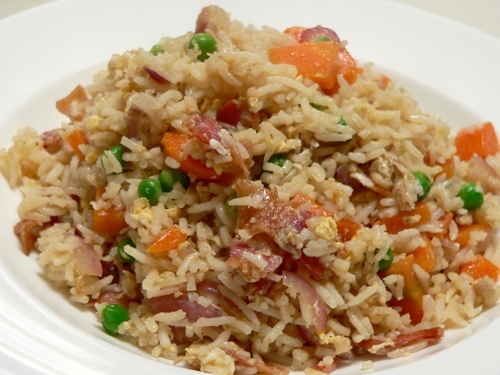 Fried rice is the epitome of Chinese homecooking. I’ve discovered that adding Italian dry cured pancetta lifts the dish to a whole new level, infusing it with a delicious, smoky flavour. Our fried rice has a multicultural slant – it’s a traditional Chinese recipe made with Indian Basmatti rice, Italian pancetta, Spanish onions, Korean enoki mushrooms and Japanese Teriyaki sauce. When I was child, my mother would often make this for breakfast, using the leftovers from the previous night’s dinner. I guess that makes this the Chinese equivalent of bubble and squeak! 1. In a large frying pan or wok, heat up a vegetable oil with a high smoking point. Add the chopped pancetta and fry briefly to render the fat. 2. The vegetables we use change every time depending on what’s in the fridge. This batch had Spanish onions, garlic, carrots, enoki mushrooms and frozen peas. 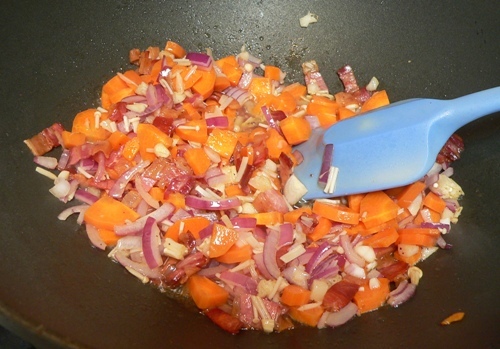 Peel and chop the fresh vegetables and add them to the wok, stir-frying until tender crisp. Don’t add the frozen peas at this stage. 3. 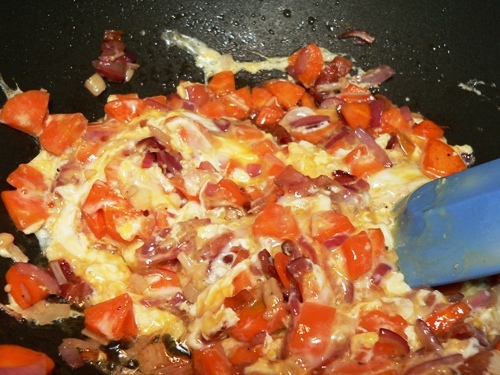 Push the vegetables to one side of the wok, and add the eggs. Some Chinese chefs work on the basis of one egg per person, but I just use whatever I have on hand. 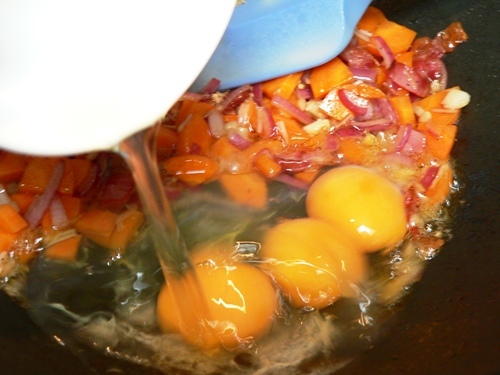 Scramble these a little, then mix them in with the rest of the ingredients. 4. Before the eggs set firm, add the peas and all the rice. Keep stirring over high heat. 5. Season with a little salt, pepper and soy sauce to taste. Tradition in my family dictates that we use Kikkoman Teriyaki sauce, but I think most Chinese cooks would use a light soy. Finish by adding just a little sesame oil for extra aroma, giving the rice one final stir over the heat before dishing out. Enjoy! Now you are talking :-) I do love rice, especially ‘left over rice’. I have often cooked rice and left it go cold just so I could make an egg fried rice with what ever other veg and meat are available. Gillian, when Big Boy was very little, we used to make a kedgeree type dish, with rice, egg, tinned tuna and cheese. He loved it soo much! Isn’t it amazing how those few drops of sesame oil right at the end totally transforms the taste of fried rice? I will have to try making it with pancetta next time. Sounds lovely. yummy!!! 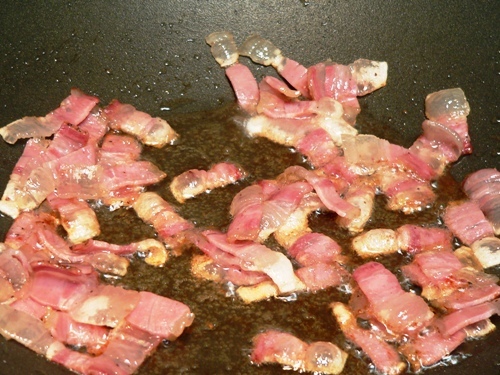 I love pancetta so will try next time I make Chinese Fried Rice to substitute for the ham I use. I’m sure it will bring the dish to a whole new level! We used to use ham, and it’s still great in this dish, but the oil from the pancetta seems to coat the rice grains and gives them a luscious mouthfeel. 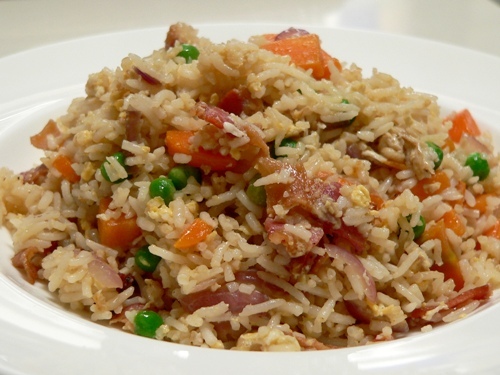 Celia, your use of pancetta in fried rice is utterly inspired! 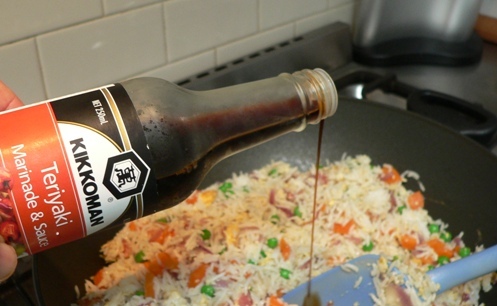 Also, it makes me feel much better about the fact that about 90% of the time, my fried rice starts with olive oil. It’s not inauthentic–it’s fusion! Looks yum! I love fried rice and probably have it way too often. Thanks for the pancetta tip – I’ll use it instead of cha xiu next time! Wink, the problem with char siew is that I never seem to have any in the house. After the pancetta, my favourite meat to use in fried rice is lap cheong, but I keep worrying what might be in it! i am so stealing this!!! we love fried rice, but i was duped into believing it was too much hassle to make at home, so we always got take-out. i know, ridiculous, but i haven’t lived so long in the us, and the only chinese available in romania was sneakers, at the flea market. and by the way: i kinda feel like we’re one of those couples who colour-coordinate when they go out: i made coconut rice today, with corn and soybeans. I can smell the sizzle of the sesame oil from here! I could eat some of that for brekkie! We love fried rice and I don’t have kikkonan teriyaki though theirs is the only soya sauce. I will pick up a bottle next time I shop. We had fusion moussaka last night: haven’t made that for about 15 years. B came home with a bag of shiny fresh white aubergines – 1kg for 99p – a bargain. I associated it with mountains of oil and endless frying of all the bits. but I got some advice on the BBC food boards: cook the aubergine slices in the oven with hardly any oil. Cook meat and drain off fat. But the sauce was so fatless that it tasted a bit boring so I put some of our homemade onion marmalade in the mix and hey presto, umami flavours all the way round! Also I made the top a different way, not a bechamel, but with a mixture of thick strained yoghurt and eggs and feta cheese and a pinch of cinammon, so it was more like a set savoury custard on top. I am not sure if it was lower in saturated fat than bechamel made with butter, but I hope so. Jo, that sounds delicious – I roast my eggplant slices as well, and then layer them into my “moussaka” – inverted commas because it’s so altered that I’m not sure any Greek would recognise it! I’ve never tried it with onion marmalade or a yoghurt and fetta topping, but it sounds most fine! Wow, I haven’t had fried rice in years. I can barely remember when but I think that will have to change now – that looks fabulous. I might try some diced tofu for vegetarian. Thankyou for inspiration. (I’m on a hot-x-bun frenzy this week for various friends and and a weekly baking order I do, so I don’t know if I’ll manage the cottage loaf before driving to Sydney next Tues). I’ve had some wonderful vegetarian fried rice, providing you can eat eggs? I think the eggs and rice are important, everything else is variable.